Good vision has its origin in the accurate focusing of sharp images on the retina of the eye. 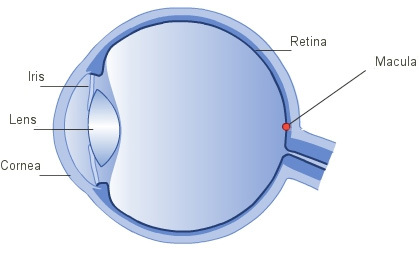 For normal vision, the optical system of the eye refracts light rays (images we see) so they are focused on the retina, typically in the fovea (macula), the area of highest resolution. 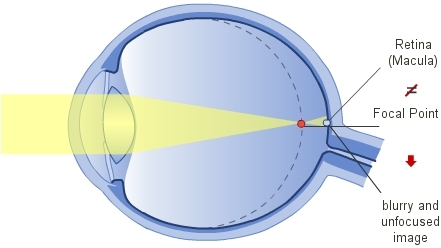 If one or more components of the eye are not precisely in tune, light rays are not focused on the retina, but rather in front or behind it, causing blurry images of the environment. This condition is referred to as refractive error, which is a collective term for nearsightedness (myopia), farsightedness (hyperopia) and astigmatism. The anatomy of the eye functions in much the same way as a camera with film. The cornea acts like a glass lens and is equivalent to the outer lens of the camera. The pupil corresponds to the aperture of the camera. The lens of the eye represents the remaining camera lenses. The retina is comparable to the film inside the camera. The cornea, pupil, and lens together produce a focused image of the environment on the retina. In much the same manner, the camera's lens produces a sharp image of the environment on the film. Before taking a picture, the lens of the camera must be focused – manually or via autofocus – so a sharp image is produced. The human eye focuses on images by automatically changing the shape of the eye's lens. A normal eye always has sharply focused distant vision. For close-up vision, such as book reading, the lens changes shape automatically to achieve sharply focused near vision. The ability of the lens to change shape decreases with age, with deterioration usually noticed after the age of 40 see presbyopia. The optical system of the eye refracts light rays (images we see) so they are focused on the retina, typically in the fovea (macula), the area of highest resolution. 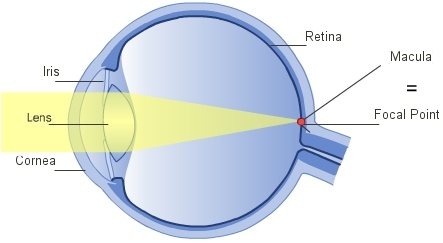 If one or more components of the eye are not precisely in tune, light rays are not focused on the retina, but rather in front or behind it, causing blurry images of the environment.